The Gauss Seidel Method (GS) is an iterative algorithm for solving a set of non-linear algebraic equations. To start with, a solution vector is assumed, based on guidance from practical experience in a physical situation. One of the equations is then used to obtain the revised value of a particular variable by substituting in it the present values of the remaining variables. The solution vector is immediately updated in respect of this variable. The process is then repeated for all the variables thereby completing one iteration. The iterative process is then repeated till the solution vector converges within prescribed accuracy. The convergence is quite sensitive to the starting values assumed. Fortunately, in a load flow study a starting vector close to the final solution can be easily identified with previous experience. The voltages substituted in the right hand side of Eq. (6.41) are the most recently calculated (updated) values for the corresponding buses. During each iteration voltages at buses i = 2, 3, …, n are sequentially updated through use of Eq. (6.41). V1, the slack bus voltage being fixed is not required to be updated. Iterations are repeated till no bus voltage magnitude changes by more than a prescribed value during an iteration. The computation process is then said to converge to a solution. If instead of updating voltages at every step of an iteration, updating is carried out at the end of a complete iteration, the process is known as the Gauss iterative method. It is much slower to converge and may sometimes fail to do SO. With the load profile known at each bus (i.e. PDi and QDi known), allocate PGi and QGi to all generating stations. While active and reactive generations are allocated to the slack bus, these are permitted to vary during iterative computation. This is necessary as voltage magnitude and angle are specified at this bus (only two variables can be specified at any bus). With this step, bus injections (Pi+ jQi) are known at all buses other than the slack bus. Assembly of bus admittance matrix YBUS: With the line and shunt admittance data stored in the computer, YBUS is assembled by using the rule for self and mutual admittances (Sec. 6.2). Alternatively YBUS is assembled using Eq. (6.23) where input data are in the form of primitive matrix Y and singular connection matrix A. A significant reduction in the computer time can be achieved by performing in advance all the arithmetic operations that do not change with the iterations. The iterative process is continued till the change in magnitude of bus voltage, |ΔVi(r+1)| between two consecutive iterations is less than a certain tolerance for all bus voltages, i.e. Computation of slack bus power: Substitution of all bus voltages computed in step 3 along with V1 in Eq. (6.25b) yields S1* = P1 — jQ1. Computation of line flows: This is the last step in the load flow analysis wherein the power flows on the various lines of the network are computed. 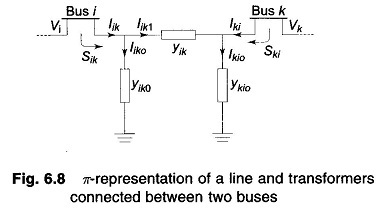 Consider the line connecting buses i and The line and transformers at each end can be represented by a circuit with series admittance yik and two shunt admittances yik0 and yki0 as shown in Fig. 6.8. The power fed into the line from bus i is. The power loss in the (i — k)th line is the sum of the power flows determined from Eqs. (6.48) and (6.49). tTotal transmission loss can be computed by summing all the line flows (i.e. Sik + Ski for all i, k). It may be noted that the slack bus power can also be found by summing the flows on the lines terminating at the slack bus. where α is a real number called the acceleration factor. A suitable value of α for any system can be obtained by trial load flow studies. A generally recommended value is α = 1.6. A wrong choice of cc may indeed slow down convergence or even cause the method to diverge. This concludes the load flow analysis for the case of PQ buses only. At the PV buses, P and |V| are specified and Q and δ are the unknowns to be determined. Therefore, the values of Q and δ are to be updated in every GS iteration through appropriate bus equations. This is accomplished in the following steps for the ith PV bus. The algorithm for PQ buses remains unchanged. As explained already, physical limitations of Q generation require that Q demand at any bus must be in the range Qmin→Qmax. If at any stage during the computation, Q at any bus goes outside these limits, it is fixed at Qmin or Qmax as the case may be, and the bus voltage specification is dropped, i.e. the bus is now treated like a PQ bus. Thus step 1 above branches out to step 3 below. 3. If Qi(r+1) < Qi,min, set Qi(r+1) = Qi,min and treat bus i as a PQ bus.Compute Ai(r+1) and Vi(r+1) from Eqs. (6.52) and (6.45), respectively. If Qi(r+1) > Qi, max, set Qi(r+1) = Qi, max and treat bus i as a PQ bus. Compute Ai(r+1) and Vi(r+1) from Eqs. (6.52) and (6.45), respectively. Now all the computational steps are summarized in the detailed flow chart of Fig. 6.9 which serves as a basis for the reader to write his own computer programme. It is assumed that out of n buses, the first is slack as usual, then 2, 3, …, m are PV buses and the remaining m + 1, n are PQ buses.